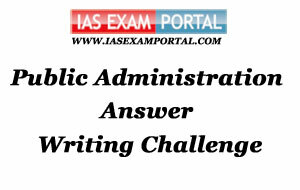 Weekly Mains Exam 2016 Answer Writing Challenge - Public Administration "MODULE- 44" | IAS EXAM PORTAL - India's Largest Community for UPSC Exam Aspirants. Weekly Mains Exam 2016 Answer Writing Challenge - Public Administration "MODULE- 44"
Public Administration- Paper I "Syllabus Topic – Accountability and control : Citizen Charter"
The Citizen’s Charter has its genesis in United Kingdom 1991, with an aim to make the administration more citizen centric and to reduce the widening trust deficit. In India it was adopted in 1997 aiming at continuously improving the quality of services so that services respond to the needs of the people. It ensures the Rights of the public and the obligations of the Public Servants. It design serves as a tool that ensures greater consultation with the clients and other stakeholders (cutting edge officers) in the formulation of the citizen’s charter so that there are realistic expectations both from the client and the service provider. Its mechanism of grievance redressal also empowers the clients to ensure timely delivery. However, challenges have been found in its effective implementation. c) Greater public satisfaction with services. The Department of Administrative Reforms and Public Grievances conducted an independent evaluation in 2002-2003 which highlighted that the Charter’s were not being designed with adequate consultation. There was low level of awareness among the citizens and the administrative professionals lacked the same vision which the charter aimed to fulfill. It was hence observed that despite its high ideals, the charter had not been successful in achieved high standards of public services and accountability. It is meant to be a toolkit of initiatives and ideas to raise the level of standards and service delivery and increase public participation, in the most appropriate way. The Charter should be an effective tool to ensure transparency and accountability and should help deliver good governance if implemented vigorously by the government departments. Indian Administration- Paper II "Syllabus Topic – Public Sector Undertakings: Public sector in modern India"
Q2. Discuss the nature and role of advisory bodies in governance with citing examples from Indian Administration.